I think multi colored yo-yo pillow is not convenient, but surly is beautiful for decorating home. Do you like sewing things by yourself on your free time? If yes, then you should definitely have a look at this gorgeous tutorial. I love having a beautiful bedroom and one thing is for sure, pillows make a big difference to how your bedroom looks like. I know that nowadays is very easy to go in the market and buy a gorgeous pillow for 5$, but that’s not the same as the one in which you have invested your time and emotions into. The beauty of the Yo-Yo Pillow’s is that you can play around with colours, design and all the rest. It doesn’t have to be the exact same as the one in the picture. You can add a bit different things and still look cute and well done. 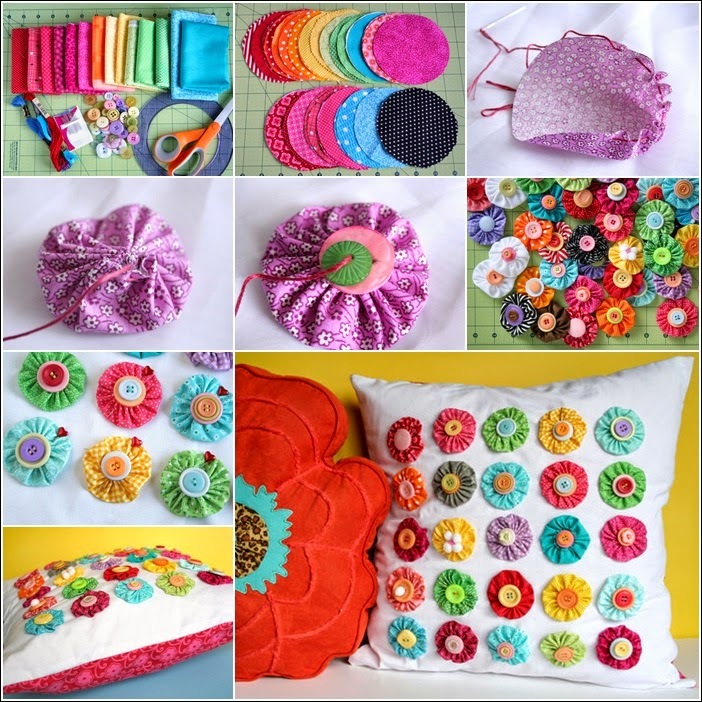 For this tutorial you will need assorted buttons, fabric of different colour and material, scissors and of course, a pillow! Cut the fabric as the picture indicates, which means in same size. In order to get the pleated pinwheel, you will need to sew the fabric based on the tutorial below. Repeat the same process for all the fabrics and when you have around 20-30 pinwheel, get ready to sew them into the pillow. Once you do that, take a picture and share it with us, your friends and your family. It is worth showing something which you feel proud of. You can do this as a gift for someone or simply to place them in your bedroom. So we have finished writing the post Multi Colored Yo-Yo Pillow Tutorial and wish to offer you the interior designs so that you can share with friends and relatives on Facebook Twitter and Google Plus and other social networks and digital networks, also you can send comments through the box below to express your opinion on the article, so you could send suggestions and preferences to take into consideration for editing and adding, a bouquet of love appreciation and respect sent to you through Interior4Design platform.